Learn how to take the skills and knowledge you use to make games for entertainment to make serious games: games for education, training, healing, and more. 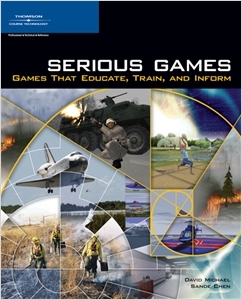 "Serious Games: Games That Educate, Train, and Inform" teaches game developers how to tap into the rapidly expanding market of serious games. Explore the numerous possibilities that serious games represent such as the ability to teach military training in a non-lethal environment and the ability to convey a particular political viewpoint through a game's storyline. You'll get a detailed overview of all of the major markets for serious games, including the military, educators, government agencies, corporations, hospitals, non-profit organizations, religious groups, and activist groups. Discover the goals of each market, the types of games on which they focus, and market-specific issues you need to consider. Case studies of how professionals in these various markets utilize games provide ideas and inspiration as well as credibility for serious games. "Serious Games" shows you how to apply your game development skills to a new and growing area and also teaches you techniques to make even entertainment-based games richer and more meaningful. Covers techniques to make entertainment-oriented games richer and provide a deeper experience. The focus on serious games continues to grow--from coverage in the media to conferences and buzz within the game development community. Provides an overview of the major markets for serious games, including current examples and future anticipation. David "RM" Michael has been a professional programmer for over 10 years, in a variety of industries, including video games. He is the owner of DavidRM Software (http://www.davidrm.com) and co-owner of Samu Games(http://www.samugames.com), both independent software companies.<BR />David is the author of The Indie Game Development Survival Guide (Charles River Media; ISBN:1584502142) and was a contributor to Game Design Perspectives (Charles River Media; ISBN:1584500905) on the topic of online community. He has written articles about game development, and covered the Game Developer Conference and the Indie Games Conference for GameDev.Net (http://www.gamedev.net). He has also written role-playing game articles (http://www.davidrm.com/rpg/) and designed his own (unpublished) dice-and-paper RPG rules system. Finally, David has been the editor and primary contributor for the monthly newsletters of both The Journal (http://www.davidrm.com/thejournal/newsletter/) and Artifact (http://www.samugames.com/artifact/news.shtml). A freelance writer/game designer, Sande Chen has been active in the gaming industry for over five years. She has written for mainstream and industry publications, such as GameDev.Net (http://www.gamedev.net), and was a contributor to Secrets of the Game Business (Charles River Media; ISBN: 1584502827) on the topic of online business models. Her past game credits include IGF winner Terminus, Siege of Avalon, Scooby Doo, and JamDat Scrabble. Sande graduated from the Massachusetts Institute of Technology with dual degrees in Economics and in Writing and Humanistic Studies. Afterwards, she continued to combine her love of creative media with her analytical skills by earning a M.Sc. in Economics from the London School of Economics and a M.F.A. in Cinema-Television from the University of Southern California. In 1996, she was nominated for a Grammy in music video direction. Part 1. What are Serious Games?